Tens of thousands marched across Australia Sunday on a third day of worldwide rallies as pressure mounts on global leaders to strike a pact on cutting greenhouse gases at crucial talks in still-shaken Paris. Some 150 leaders including US President Barack Obama, China's Xi Jinping, India's Narendra Modi and Russia's Vladimir Putin will attend the start Monday of the UN conference, tasked with reaching the first truly universal climate pact. 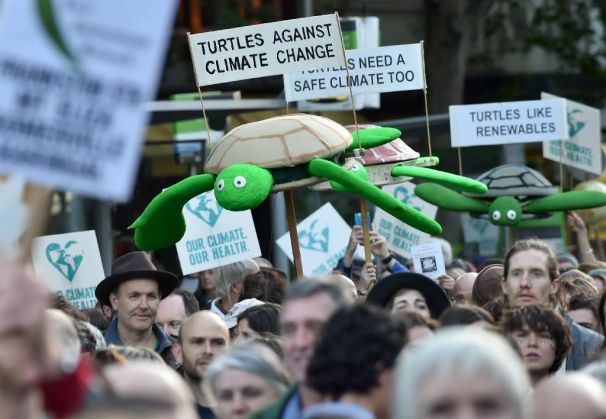 Rallies demanding curbs to carbon pollution have been growing since Friday, with marches across Australia Sunday kickstarting a final day of people-powered protest. Similar events were planned for Rio de Janeiro, New York and Mexico City, while 1,000 braved rain in Seoul, with scientists warning of superstorms, drought and rising sea levels swamping vast areas if concrete action is not taken. "There is no Planet B," said one placard in Sydney where 45,000 people converged, while another read: "Solidarity on a global scale". "In 10 years' time our children are going to say, 'Mum, did you know about this? What was everyone doing?" A large protest in Melbourne on Friday kick-started the global campaign, with rallies on Saturday from New Zealand to the Philippines, Bangladesh, Japan, South Africa and Britain. A march of some 5,000 people in Adelaide on Sunday focused on the global impact which climate change has on health, food security and development, particularly among the world's poorest. "Those who did the least to cause the problem are feeling the impacts first and hardest, like our sisters and brothers in the Pacific," said Judee Adams, a community campaigner with Oxfam. Many low-lying Pacific nations such as Kiribati, Tuvalu and the Marshall Islands fear they could disappear beneath the waves completely as sea levels rise. The message to curb global warming and help poor countries deal with climate change was hammered home by religious leaders in Paris, who delivered petitions with almost 1.8 million signatures from people around the world. In the past week the UN's weather body said the average global temperature for the year 2015 is set to rise one degree Celsius above pre-industrial levels, halfway towards the Paris conference's attempted limit. And analysts say voluntary carbon-curbing pledges submitted by nations to bolster the Paris pact, even if fully adhered to, put Earth on track for warming of three degrees C.
On the eve of Saturday's protests, French President Francois Hollande, host of the November 30-December 11 talks, warned of obstacles ahead for the 195 nations seeking new limits on heat-trapping gas emissions from 2020. "But we can say the same when it comes to climate. Human beings are destroying nature, damaging the environment." But he also spoke of fears that a handful of countries -- which he did not name -- may stymie consensus if they felt the deal lacked guarantees. In Paris French authorities cancelled two demonstrations following the onslaught by gunmen and suicide bombers which killed 130 people across the city on November 13. Activists now plan to create a two-kilometre (1.2-mile) human chain along the original march route on Sunday. They will break it as they pass the Bataclan concert hall, where the worst violence claimed 90 lives, as a mark of respect to the victims. In a sign of the urgency of the talks ahead, the start of the climate negotiations themselves, conducted by bureaucrats, have been brought forward to Sunday on the eve of the official opening. About 2,800 police and soldiers will secure the conference site, and 6,300 others will deploy in Paris, with French Interior Minister Bernard Cazeneuve saying nearly 1,000 people thought to pose security risks had been denied entry into France.